MANILA (2nd UPDATE)--Manila Water announced Tuesday a "voluntary and one-time bill waiver" to compensate tens of thousands of customers whose taps ran dry earlier this month. The service outage affected some 1.2 million households in the east zone of Metro Manila, serviced by Ayala-led Manila Water. The west zone, under Maynilad Water Services Inc., is unaffected. "We deeply understand the profound frustration that our customers have expressed in the past weeks," Manila Water president and CEO Ferdinand dela Cruz said in a press conference. "And to help ease in some way the inconvenience that we have caused... we are announcing a voluntary and one-time bill waiver scheme to be reflected in the April bill of our customers," he added. All Manila Water customers, he said, will "receive a bill waiver of the minimum charge in their April bill which reflects their March consumption." The minimum charge is equivalent to the value of 10 cubic meters of water, which ranges from P76 to P656, depending on whether the supply is for domestic or industrial use, he said. 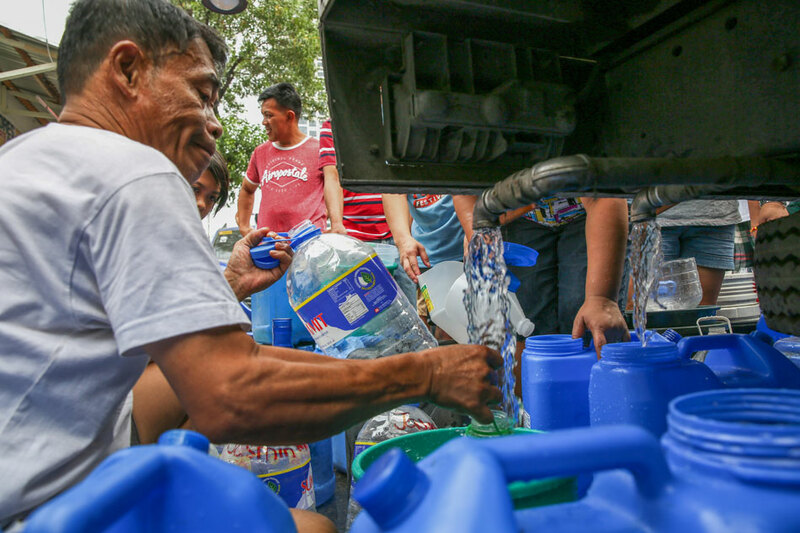 Aside from suspending the minimum charge, Manila Water will also waive fees for the whole March consumption of customers in areas that were "most severely affected" by the service outage or those "without water for 24 hours for more than a week," Dela Cruz said. "They will not be billed for their whole water consumption for March. Iyun pong pinaka-apektado, we are going to waive their March consumption," he added. Waiving the minimum charge wound cost Manila Water some P150 million, said Dela Cruz, adding that the figure does not include the waived March bills. "Kung kaya naming ibigay, ibibigay namin at ito po iyun. Alam ko hindi po namin puwedeng tapatan iyung inconvenience fully, but this is... separate and on top of whatever RO (Regulatory Office) will impose," he said. Manila Water has reduced its supply deficit to 107 million liters per day from the previous 150 million liters, said Dela Cruz. The concessionaire, he said, has restored services to 97 percent of customers, who have at least 8 to 12 hour water availability at ground floor level, as of Monday night, he said. From a high of 61 hard-hit barangays, only 8 villages are still dependent on interim water network solutions, static tanks or water tanks, he said. Some "small pockets, sitios or streets", meanwhile, experience "intermittent no-water situations resulting from operational adjustments and pressure management", said the executive. "Makakasa po kayo (you can expect) that Manila Water will continue to work round the clock for our customers," he said. President Rodrigo Duterte has directed authorities to submit by April 7 a report on how it addressed the service outage, said Metropolitan Waterworks and Sewerage System (MWSS) Administrator Reynaldo Velasco.